Over the past 20 years, female athletic participation has grown, with more opportunities for female athletes to participate in competitive athletics than ever before.1 However, with an increasing number of female athletes participating in sports, there is an increased incidence of injury. 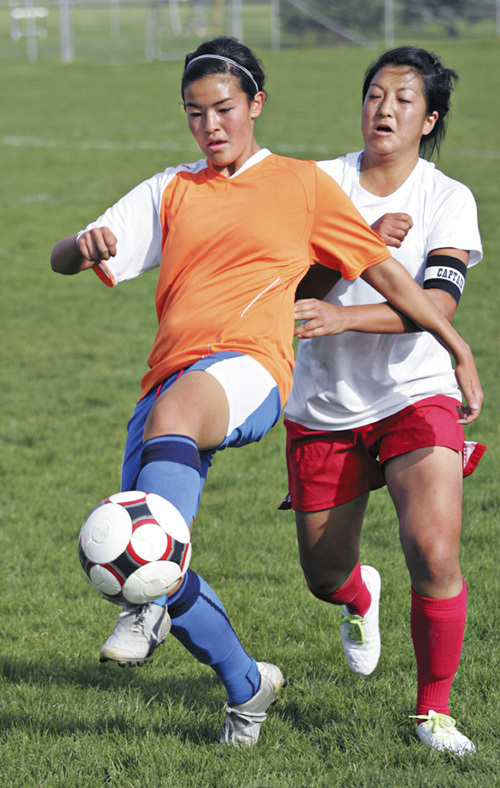 There has been a dramatic increase in the number of knee injuries, specifically anterior cruciate ligament (ACL) injuries, in female athletes who participate in certain competitive sports, like soccer. A meta-analysis of the incidence of ACL tears as a function of sport and gender in collegiate soccer studies found 11,754,568 incidences and a mean female collegiate rate of 0.32 and a mean male rate of 0.12 with a female-male ratio of 2.67.2 It is also known that more than half of all female ACL injuries occur during non-contact athletic participation.3 In a 13-year study of the National Collegiate Athletic Association injury database, Agel et al reported that 67% of all the ACL injuries sustained in females were due to non-contact mechanisms.3 The influence of gender on lower extremity jumping and cutting mechanics has been extensively studied in an attempt to understand the possible risk factors related to female non-contact ACL injury, with many studies looking at female athletes in general.4-7 While studies have also specifically examined the lower extremity kinematics and kinetics of female soccer players during landing and cutting maneuvers,8-12 few studies have looked at lower extremity mechanics involved in sport-specific maneuvers, such as kicking in soccer. 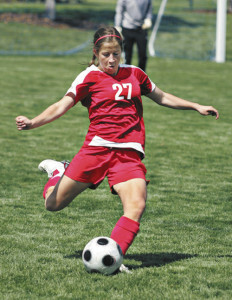 Most of the research on kicking in soccer has focused on the mechanics of the kicking leg, but one study found that 99% of all soccer-related ACL injuries recorded in their study occurred to the limb that was in contact with the ground.13 Because of the increasing incidence of ACL injury in female soccer athletes, it is necessary to examine lower extremity mechanics as possible predisposing factors related to injury. Thus an important first step to understanding lower extremity mechanics in soccer is to characterize the mechanics of the plant leg in healthy individuals performing soccer kicks. Although the mechanics of the kicking leg have been extensively studied to determine factors related to kick performance, few studies have examined the mechanics of the plant leg during a soccer kick, even though is it known that soccer injuries most often occur to the plant leg during competition.13 In the studies that have examined plant leg mechanics, the focus has been on ground reaction forces, joint displacements, strength of the plant leg, and lower extremity joint torques. An example of the kicking paradigm used to study the effect of plant leg on lower extremity joint torques in female soccer players. In the most recent study out of our lab, we examined the effect of plant leg and approach condition on the lower extremity torques of the hip, knee, and ankle in soccer kicking tasks.22 In the study, nine female collegiate athletes performed a series of kicking tasks with their dominant and non-dominant kicking leg from three different approaches (Figure 1). The approach conditions included a straight-on or center kick, an on-axis kick, and an off-axis kick. The on-axis kick, when the plant leg angle and approach angle relative to the ball were the same, represented the natural fluid motion of kicking. The off-axis kick, when the plant leg angle and approach angle were opposite, required many of the subjects to change their kicking strategy in order to achieve ball contact. 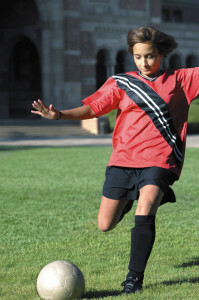 The off-axis kick was designed to mimic the unpredictable and variable kicking approaches that often occur during competitive soccer competition. However, the off-axis kick mimics cross-body or cross-midline stepping, as opposed to the type of lateral stepping involved in cutting maneuvers, which have been extensively studied in the ACL literature. Barfield examined the effects of selected kinematic and kinetic variables during instep kicking and found that when athletes kicked the ball using their non-dominant leg, they demonstrated more variability compared to the dominant limb with regard to the measures that correlated with ball velocity, especially angular position.23 Some of the measures that were associated with ball velocity included: linear velocity of the big toe at ball contact, maximum angular velocity at the knee, maximum angular position at the knee, maximum knee flexion and extension torque, and angular position of the ankle from support foot (i.e., the foot of the plant leg) contact to ball contact. We found that the peak joint torques of the dominant and non-dominant plant legs differed when participants kicked with their dominant vs non-dominant kicking limb. We speculate that the differences we observed in plant legs during an off-axis kick are consistent with findings from Barfield;23 specifically, that the increased variability may indicate a difference in the control of the non-dominant plant leg (i.e., the leg not usually in contact with the ground during kicking). Furthermore, when the female athletes in our study planted with the non-dominant leg, they produced greater amounts of braking torque (i.e., extension, external rotation, and abduction) than when planting with their dominant leg. On the other hand, the acceleration torques (i.e., flexion, internal rotation, and adduction) were lower for the non-dominant plant leg. This suggests that when the participants planted with their non-dominant plant leg, they produced a larger braking force to control the movement; therefore, utilizing a more novice kicking strategy to compensate for decreased stability in the non-dominant plant leg. Interestingly, Fagenbaum and Darling found that compensatory hamstring activity increased braking force during jumping tasks in healthy female athletes, which could indicate an attempt to decrease joint laxity and in turn prevent knee injury.24 Although that study involved basketball players, the proposed mechanism may help to explain our findings. 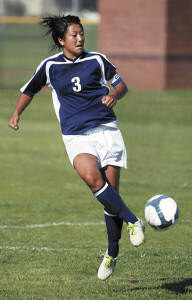 It is known that ACL injury occurs when the foot is in contact with the ground; however, to this date no studies have specifically examined the risk of ACL injury or strain on the ACL of the plant leg during kicking tasks.3,13 Thus these questions remain unanswered: Does increased strain occur to the ACL during rapid deceleration or quick stopping prior to kicking in soccer? Are soccer athletes, especially female athletes, more at risk of injuring the ACL of the plant leg when kicking with their non-dominant leg than their dominant leg and/or when using an off-axis approach? The results of our study confirmed that collegiate soccer players without prior injury display different joint torque strategies during kicking with their dominant vs non-dominant plant legs and when kicking from an off-axis approach. If these differences occur in healthy female soccer athletes, the next step would be to determine if differences also occur in those who may demonstrate other proven risk factors for ACL injury and those who have already suffered an ACL injury. 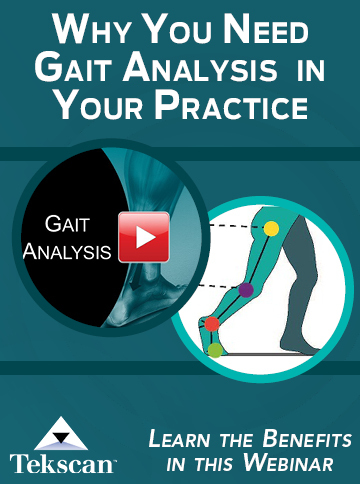 This would further explore and provide insight into the association of lower extremity biomechanics and ACL injury, enhancing our ability to predict injury and further identify exact mechanisms of ACL injury in specific sports like soccer. In conclusion, the findings from our study provide new information on the mechanics of the plant leg during maximal effort kicking. Collegiate level female soccer players display very different joint torque strategies in the dominant and non-dominant plant legs during off-axis kicks. It needs to be determined if differences in the mechanics of off-axis kicks emerge between healthy participants and those who have suffered an ACL injury. The differences in peak joint torques of the plant leg during kicking found in our study and the findings from other plant leg studies advance the understanding of lower extremity mechanics in female athletes, who are at an increased risk of ACL injury. 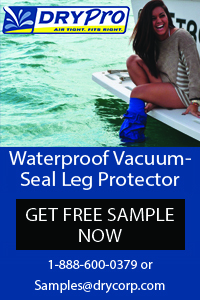 Further investigation must be made into lower extremity biomechanics and plant leg control in those who have suffered an ACL injury, in order to identify exact mechanisms of injury and possibly identify those who are more susceptible to injury. Sarah E. Clagg, DPT, ATC, is a practicing sports medicine physical therapist and certified athletic trainer at Good Samaritan Hospital in Dayton, OH. Angela R. Warnock, MPT, is a practicing physical therapist at Ohio State University Children’s Hospital Sports Medicine Center in Columbus, OH. 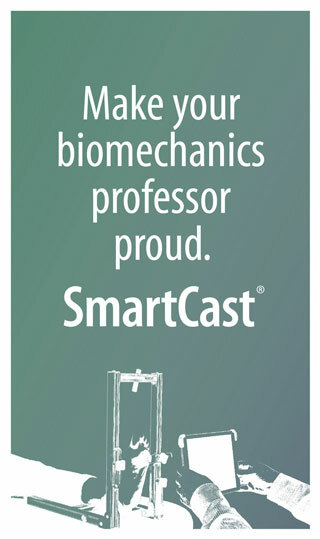 James S. Thomas PT, PhD, is an associate professor in the school of physical therapy and director of the Motor Control Laboratories at Ohio University in Athens, OH. 1. Lopiano DA. Modern history of women in sports. Twenty-five years of title IX. Clin Sports Med 2000;19(2):163-73, vii. 2. Prodromos CC, Hang Y, Rogowski J, Joyce B, Shi K. A meta-analysis of the incidence of anterior cruciate ligament tears as a function of gender, sport, and a knee injury–reduction regimen. Arthroscopy 2007; 23(12):1320-1325.e6. 3. Agel J, Arendt EA, Bershadsky B. Anterior cruciate ligament injury in national collegiate athletic association basketball and soccer: a 13-year review. Am J Sports Med 2005;33(4):524-530. 4. McLean SG, Huang X, van den Bogert AJ. Association between lower extremity posture at contact and peak knee valgus moment during sidestepping: implications for ACL injury. Clin Biomech (Bristol, Avon) 2005;20(8): 863-870. 5. Hewett TE, Torg JS, Boden BP. Video analysis of trunk and knee motion during non-contact anterior cruciate ligament injury in female athletes: lateral trunk and knee abduction motion are combined components of the injury mechanism. J Sports Med 2009;43:417-422. 6. Sigward S, Powers CM. The influence of experience on knee mechanics during side-step cutting in females. Clin Biomech (Bristol, Avon) 2006;21(7):740-747. 7. Golden GM, Pavol MJ, Hoffman MA. Knee joint kinematics and kinetics during a lateral false-step maneuver. J Athl Train 2009;44(5):503-510. 8. Hewett TE, Ford KR, Myer GD, Wanstrath K, Scheper M. Gender differences in hip adduction motion and torque during a single-leg agility maneuver. J Orthop Res 2006;24(3):416-421. 9. Ford KR, Myer GD, Smith RL, Vianello RM, Seiwert SL, Hewett TE. A comparison of dynamic coronal plane excursion between matched male and female athletes when performing single leg landings. Clin Biomech (Bristol, Avon) 2006;21(1):33-40. 10. Pollard CD, Sigward SM, Powers CM. Gender differences in hip joint kinematics and kinetics during side-step cutting maneuver. Clin J Sports Med 2007;17(1):38-42. 11. Pollard CD, Davis IM, Hamill J. Influence of gender on hip and knee mechanics during a randomly cued cutting maneuver. Clin Biomech (Bristol, Avon) 2004;19(10):1022-1031. 12. Sigward SM, Ota S, Powers CM. 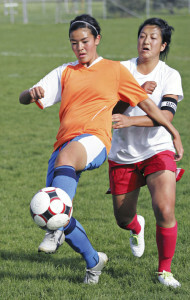 Predictors of frontal plane knee excursion during a drop land in young female soccer players. J Orthop Sports Phys Ther 2008;38(11):661-667. 13. Fauno P, Wulff Jakobsen B. Mechanism of anterior cruciate ligament injuries in soccer. Int J Sports Med 2006;27(1): 75-79. 14. Isokawa M, Lees A. A biomechanical analysis of the in-step kick motion in soccer in Reilly T, Lees A, Davids K, Murphy WJ (Eds). Science and football, London, England: Routledge 1988; 449-455. 15. Mognoni P, Narici MV, Sirtori MD, Lorenzelli F. Isokinetic torques and kicking maximal ball velocity in young soccer players. J Sports Med Phys Fitness 1994;34(4):357-361. 16. Dorge HC, Anderson TB, Sorensen H, Simonsen EB.Biomechanical differences in soccer kicking with the preferred and the non-preferred leg. J Sports Sci 2002;20(4):293-299. 17. Nunome H, Ikegami Y, Kozakai R, Apriantono T, Sano S. Segmental dynamics of soccer instep kicking with the preferred and non-preferred leg. J Sports Sci 2006;24(5):529-541. 18. Orloff H, Sumida B, Chow J, Habibi L, Fujino A, Krammer B. Ground reaction forces and kinematics of plant leg position during instep kicking in male and female collegiate soccer players. Sports Biomech 2008;7:238-247. 20. Kellis E, Katis A, Gissis I. Knee biomechanics of the support leg in soccer kicks from three angles of approach. Med Sci Sports Exerc 2004;36(6):1017-1028. 21. Masuda K, Kikuhara N, Demura S, Katsuta S, Yamanaka K. Relationship between muscle strength in various isokinetic movements and kick performance among soccer players. J Sports Med Phys Fitness 2005;45(1):44-52. 22. Clagg SE, Warnock A, Thomas JS. 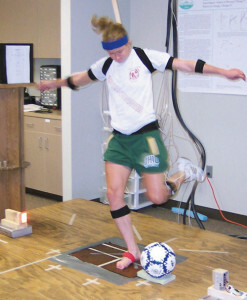 Kinetic analyses of maximal effort soccer kicks in female collegiate athletes. Sports Biomech 2009;8(2):141-153. 23. Barfiled W. Effects of selected kinematic and kinetic variables on instep kicking with dominant and non-dominant limbs. J Hum Mov Stud 1995;29:251-272. 24. Fagenbaum R, Darling WG. Jump landing strategies in male and female college athletes and the implications of such strategies for anterior cruciate ligament injury. Am J Sports Med 2003;31:233-240. A very interesting topic as we have been working with the Bio-Engineering group at Binghamton University on a technology that measures muscle force during functional activities. Our focus has been on the muscles surrounding the knee. In our limited testing we have found that the non dominant kicking leg has favorable quadriceps to hamstring ratios. Our assumption is that this is a function of the repetitive eccentric loading of the plant leg. Great to see the discussion on the plant leg. Thought you might be interested in the work we are doing – and the blog post in which we discuss the importance of the plant leg in assessing propensity for ACL tears.